Bloodhound from Apex Legends. This is one of the Legends you can play as. 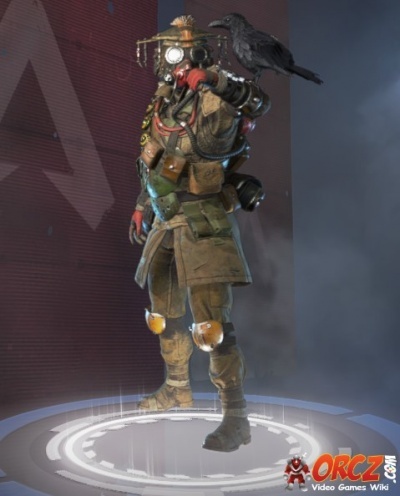 Bloodhound is one of the characters you can choose in Apex Legends. The bloodhound is a hunter and a tracker able to aggressively hunt down his foes. Tactical Ability Eye of the Allfather Reveal traps, hidden foes, and clues at structures in front of you for a short time. Passive Ability Tracker Foes leave behind tracks for you to find. Ultimate Ability Beast of the Hunt Move faster and enemies are highlighted for easier spotting. This page was last modified on 29 March 2019, at 23:16. Content is available under Creative Commons Attribution Non-Commercial Share Alike unless otherwise noted.